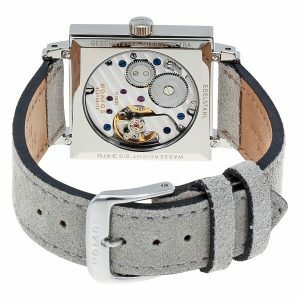 At 2018 SIHH, approx 800 watch manufacturers displayed their the latest products in Basel. Basel Watch Fair boasts rich range of watches from the entry-level models pricing thousands of dollars to the top models pricing ten of millions of dollars. An ocean of clocks and wristwatches. Nomos Glashutte, a German nicha brand, drew people’s attention successfully. 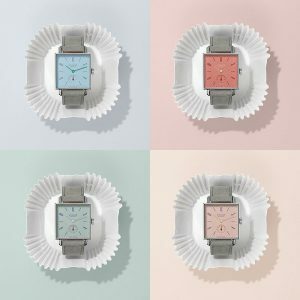 NOMOS Glashütte is a German watchmaking company based in Glashütte, Saxony, which specializes in manual-winding and automatic mechanical watches. It was founded in January 1990, two months after the fall of the Berlin Wall, by Roland Schwertner. It only has a history of 28 years so far. With Bauhaus style, in-house movements and the honor of German IF Design Award, Nomos Glashutte quickly became a well-known German brand. 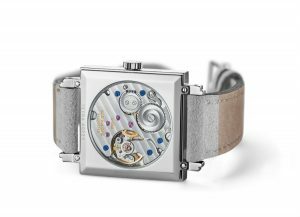 Nomos Glashutte ranks behind A. Lange & Söhne and Glashütte Original, the third watch brand in Germany. As for Nomos Glashutte, the Tetra Petit Four gave a deep impression on me at this SIHH. 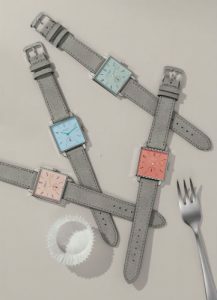 With square watch case and Bauhaus style, Nomos Tetra Petit Four shows Macaroon-flavored dial emphatically, attractive and delicious! 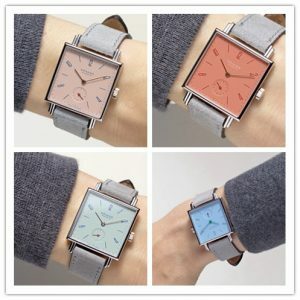 Available in the Tetra Pearl, Grenadine, Matcha and Azure, and each of them sets off ladies’ slender wrists. Thanks for 2.6mm-thick Nomos Alpha manual winding movement, the Tetra Petit Four mechanical watch is worn around ladies’ slender wrists, delicate, light-weight and young and energetic. The Grenadine and Rose dial with gold-plated hands; and the Matcha green dial with rhodium-plated hands, and the Azure dial with green hands. Color-clash hour markers fall on the four different kinds of dials, extending distinctive visual effects. Smooth and bright watch case and vertical lugs bring out the angular character, rational, calm and elegant. 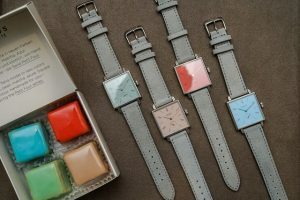 The sweet Macaroon-flavored dials add fresh, sweet and cute style to the square case. The exact operating of the manual winding movement is seen clearly through sapphire crystal case back of the Tetra Pearl and Grenadine. While, the Matcha and Azure with stainless steel case back provide the service for engraving the declaration of love or special words. Your wristwatch or your love is distinctive from others. Four Tetra mechanical watches are equipped with Nomos Alpha calibre, a highly acclaimed classic movement. Made by hand in Glashutte, each of Nomos Alpha movements is decorated with Glashutte patterns, blued-steel screws and Nomos fish-scale patterns. Equipped with Incabloc Shock Protection System, it guarantees accuracy and reliability of the watch under shock. It’s worth mentioning that Alpha calibre is adjusted in six positions (crystal up, crystal down, crown down, 12 O’clock position down, 9 O’clock position down and 6 O’clock position down). In general, Swiss-made movements are only adjusted in five Positions (not including 6 O’clock position down). 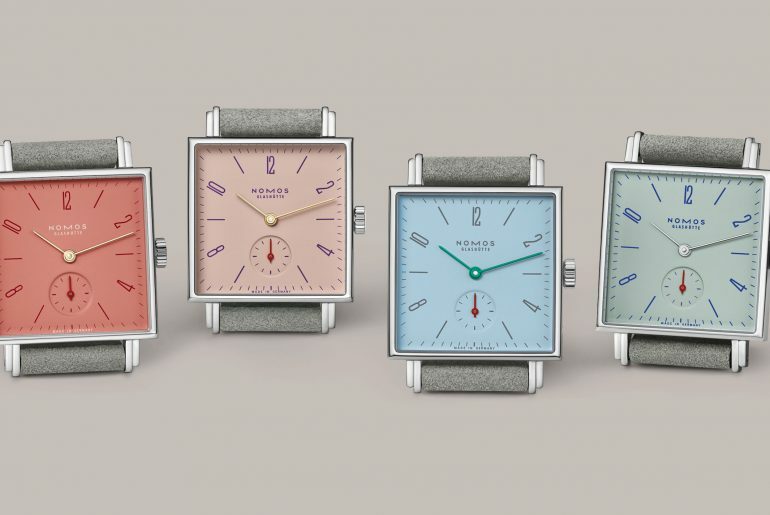 We know Nomos is serious about the performance of the Alpha movement.